As a food supplement for pregnant and lactating women. 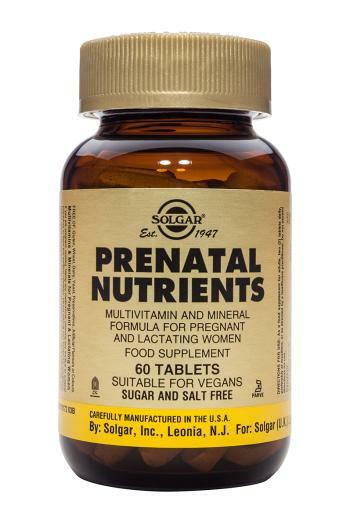 Two (2) Solgar Prenatal Nutrient tablets daily, preferably at mealtime, or as directed by a healthcare practitioner. Do not exceed directions for use. Accidental overdose of iron–containing products is a leading cause of fatal poisoning in children under 6. Keep this product out of reach of children. In case of accidental overdose, call a doctor or poison control centre immediately. +A unique form of chelated iron (iron bisglycinate) formulated for maximum absorption without the gastrointestinal irritation or constipating effects that often accompany iron supplementation. Albion Process Amino Acid Chelate. Patent No. 4,599,152.
microcrystalline cellulose, stearic acid, magnesium stearate, silicon dioxide, cellulose gum, hydroxypropylmethyl cellulose, vegetable glycerin.